There are certain regimens that one would do in order to balance the color of their skin. 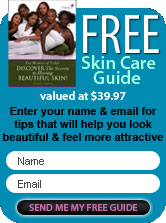 A good black skin care regimen would consist of cleansing, toning and moisturizing. After you get the basics right, then you've got the other beauties like exfoliation and serums that you can add. They will help you treat other challenges that you may be having with your skin. Cleansers- When you use a cleanser, cleansing is the most important part of your black skin care regimen. The key here is to make sure you're not using an aggressive detergent based product that would strip the good oils from your skin. You over-cleanse your skin because you've been conditioned to believe that harsh foamy cleansers are effective and that's not necessarily true. But when you use harsh cleansers they can create a host of problems as your skin is trying to correct itself. Mother nature provides excellent alternatives to synthetic cleansing products. And there are very gentle cleansers that can be used in order to give your skin that balance that it looks for and tries to get back to every day. At Nyraju Skin Care we've created a Green Tea Facial Cleanser, which has a lactic acid base, which means milk based. Milks feed your skin and they can pull that excess oil from your skin as well as bring balance to your skin. So when you're looking for a product from the Nyraju Skin Care line that can be used across the board, the Green Tea Facial Cleanser is such a product that will treat normal, acne, oily and mature skin. Toners not only adjust the pH level of your skin, but they can also remove any traces of dirt after cleansing. The only traces of dirt you will see after cleansing is that dirt that wasn't removed because you didn't thoroughly cleanse your face. The best toners are hydrosols and these are like homeopathic waters or by products of any steam distillation from an essential oil. So we recommend our Rosewater Toner. Rosewater a blend of Aloe Vera juice and Rose essential oil, which is one of the ingredients in the toner. It has the highest vibration and is very good for your skin (young or mature). The Aloe Vera acts as humectants to draw moisture into your skin. So using this toner for cleansing can assist you in recharging your skin as well as making it glow. Moisturizers have what's typically known as a two-fold purpose. They draw moisture into the skin and they seal it in. This is why it's always a good idea to put on a moisturizer right after you've cleansed and toned your face while your skin is still damp. Moisturizers and toners also support the outer layers of your skin by filling up what's known or perceived as gaps between cells of the skin. In this respect you have natural creams that are going to outshine synthetic products. You can use products that are specifically formulated for African American skin because often times you'll find not every product on the shelf has your melanin, your skin texture or skin type in mind. The moisturizer in our line is what's known as Antioxidant Face Cream. It has been specially formulated for your beautiful black skin. It's packed with antioxidants that fight any and every sign of maturing for women of color. One of the ingredients is wheat germ. So many of you are looking for products that will lighten and brighten dark spots that would show up on your face, whether it's picking chin hairs, popping pimples or even using medication. Wheat germ can often help you with this challenge, naturally. This particular moisturizer has also been said to give your skin a feel as if it were the texture of silk. Aloe Vera is another one of the ingredients that stimulates new skin growth and it helps to cleanse, purify and detoxify your skin, leaving it feeling clean and fresh. Rose hip is another one of the ingredients in the antioxidant face cream that we provide. Rose hip makes your skin more elastic, helping it to look younger and say goodbye to those wrinkles that do show up and sagging skin. One of the other important ingredients is avocado. It is a natural moisturizer that gives your skin that texture of silk also. When you look at cleansing, toning and moisturizing, it's the regimen itself that's going to give you that basic, simple element to creating this beautiful canvas in which your skin becomes.